The Adidas Essential combo training weight bench is for beginners who want to set up a home gym. This starter weight bench comes with a set of 100lb weight plates, making it perfect for novice lifters who are just starting their journey in strength training. The entire sets comprises of a barbell with free weights, upright bars with weight rests, inclined back pad, a seat and leg attachments for working out lower body muscles. So, is this combo weight bench what you need? 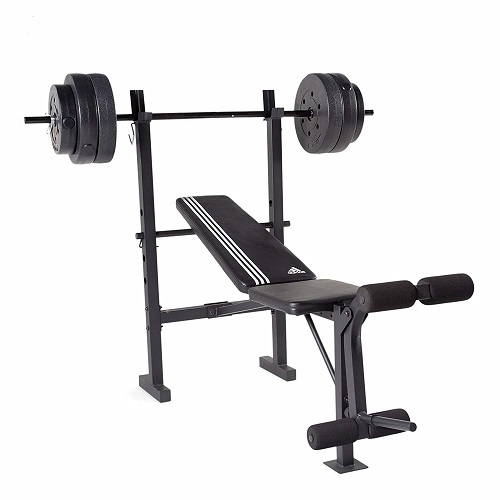 Find out by reading this quick Adidas Essential Combo training bench with weight set review. Assembling the Adidas Essential combo weight bench is easy thanks to the detailed user manual that comes with the set. You will receive nut locks, bolts and washers needed to put the bench together. An Allen wrench is included in the package, but there is no screwdriver and adjustable hex wrench, which you will need for assembly. The 100lb weight plates in this set are made of vinyl. You can secure them on the bar using spring clamps, which are included in the package. Adidas designed their essential combo weight-training bench with sturdiness in mind. The frame is made of steel tubing to ensure strength and durability. To ensure comfort, the incline back pad and seat both have high-density padding. As a result, you can perform routines such as the military press as well as incline and flat bench press comfortably. Leg lever with foam rollers: At the foot of this weight bench, there is a reclining leg lever with 4 attachment points for the feet. A protruding rod allows you to load weight plates on the lever to add some resistance to leg workouts. The foot attachment points are also padded with foam rollers so that you can perform leg extensions or hamstring curls without feeling uncomfortable. Is the Adidas Essential Combo Training Bench with Weight Set Worth Buying? If you are looking for an entry level combo weight bench, this model from Adidas is a decent choice at an affordable price. It is not as sturdy as a commercial bench press but the frame can support maximum user + training weight load of up to 300lb as per specifications included in the instruction manual. The weight bench can become flimsy overtime when connections for various parts loosen up. It is therefore a good practice to check whether all nuts and bolts are tight when the bench becomes even the least bit unstable. Having a spotter with you before lifting weights is also prudent in order to avoid incidents. To sum it all up, the Adidas essential combo training bench with weight sets is a decent startup bench that strikes a good balance between durability, functionality and comfort. It comes with everything you need to start lifting weights without having to buy a bunch of accessories separately. To avoid disappointments, keep in mind that this is a startup weight bench for home gyms. Therefore, it should not be chosen as a cheaper alternative over a commercial bench press.